El pasado 7 de noviembre, en la inauguración de la I Cumbre Mundial de Presidentes de Agencias de Viajes, en Córdoba, el secretario general de la Organización Mundial del Turismo, Taleb Rifai, dirigió unas inspiradoras palabras a los más de cien delegados asistentes. Lejos de cumplir con el expediente con palabras vacías y discursos repetitivos, Rifai arengó a los representantes de una industria muy castigada por la crisis económica y por los cambios en los hábitos de los viajeros. Por el gran valor de sus palabras, reproducimos a continuación el discurso tal y como fue escrito. En V.O. Es un placer estar en Cordoba con vosotros. 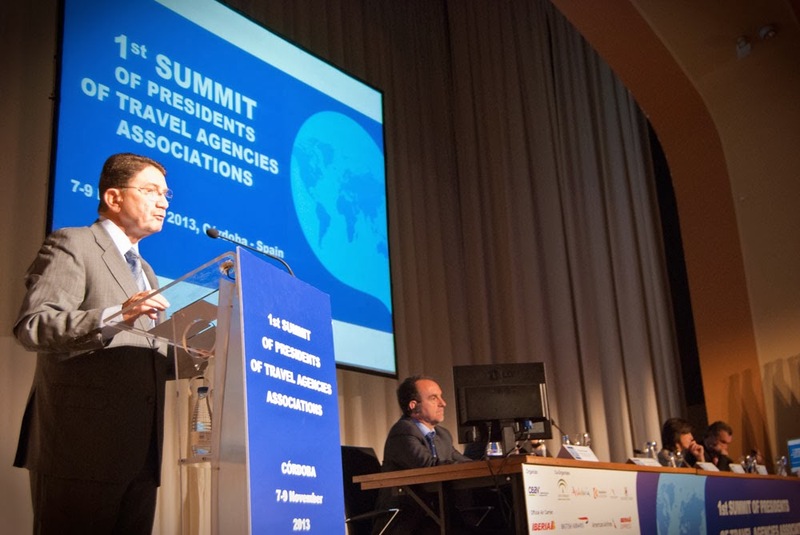 It is indeed a great pleasure and an honour to join you on the occasion of the First World Summit of the Presidents of Travel Agents Associations, here in beautiful Cordoba. On behalf of the World Tourism Organization, the UN specialized agency for tourism, I wish to extend my gratitude to the Confederacion Española de Agencias de Viajes for the opportunity to address this important and timely gathering. I am happy to say that we work in a sector full of good news. In 2012, international tourist arrivals grew 4% to reach over one billion; income generated by international tourism followed and soared to US$ 1.3 trillion. In the eight months of this year, the number of tourists travelling worldwide grew by 5%, well ahead of our initial forecast for 2013, to reach almost 500 million. The forecast for the rest of the year looks positive too. Moreover, UNWTO’s long-term forecast, "Tourism Towards 2030", predicts that 1.8 billion people will be crossing international borders every year in 2030, which is equivalent to an additional 43 million additional tourists travelling the world every year for the next two decades. Clearly, this is a sector full of opportunities! And as a key component of the tourism sector, Travel Agents have much to be optimistic about. However, as we all know very well, in the age of internet and social media, the role of the travel agent is changing rapidly. The changes are challenging, yes, but also very exciting. The role of the travel agents has changed and now its goes beyond the traditional role of providing information to customers and booking a trip. They are the true "face" of any destination, the vital link between the all of us looking for a unique experience and the city, the hotel or the beach that will make us bring back a new memory. Your value is in acting as specialists in the complex areas of decision-making and travel organisation - in adding value to each step of the travel experience. You help people save time! Yes we have lots of information at our fingertips, but putting this all together can be incredibly difficult and time consuming. Expedia Media Solutions recently found that the average packaged-travel purchase takes place after 38 visits to various websites. Some people may find this fun. A great many others will not and this is where your knowledge, savvy and access to quality information come in to save the day. You give people peace of mind. Customers are willing to pay for the services of modern, high-tech travel agent who are conversant with global security, different airline types and fare classes, and the unique rules for standbys, upgrades, cancellations, itinerary changes, and other purchase restrictions. You provide recommendations in uncertain waters, such as choosing and coordinating local travel across several countries, and can be a lifeline when the next Icelandic volcano goes off, or national strike takes place. You add value through personalising the service and passing on industry benefits. You can change a holiday from being memorable to being unforgettable by suggesting specialised activities to meet the needs of your clients, or getting them upgrades through your contacts in the industry. The little things all add up to making a better travel experience! I said at the beginning of my speech that tourism is set to continue its remarkable growth, creating wealth and jobs not just in tourism, but in other sectors as well, and of course generating export revenues and supporting the balance of payments. But, just like any sector, tourism has downsides too. development and that contributes to the wellbeing of countries and communities worldwide. UNWTO’s main policy document, the UNWTO Global Code of Ethics for Tourism, guides this commitment. Adopted in 1999 by the General Assembly of World Tourism Organization, and two years later by the General Assembly of the UN, the Code provides a road map for the development and implementation of responsible and sustainable tourism. Travel Agents, with their key role in shaping our sector, can and should also play a key role in promoting its sustainability. Therefore, UNWTO is delighted to have, on the occasion of this Summit, 12 associations joining the Private Sector Commitment to the UNWTO Code of Ethics for Tourism, and thus pledging to promote and implement the values of responsible and sustainable tourism in their governance and business practices. Travel agents have an exciting and important future in the evolving tourism sector.